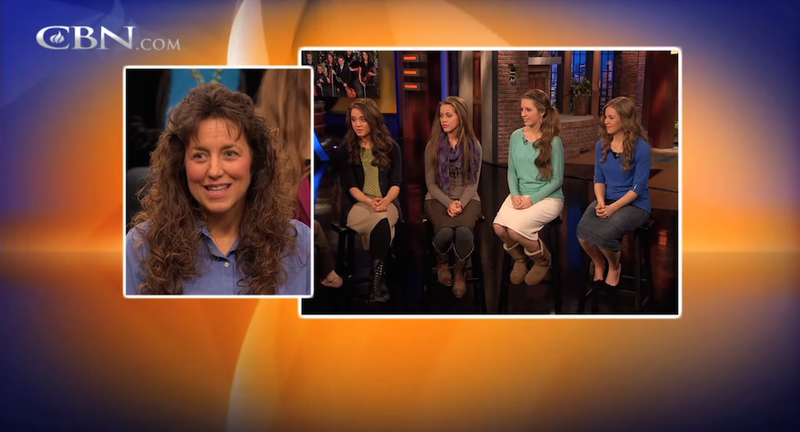 Last year, Cosmopolitan ran an interview with four of the Duggar daughters during the women’s promotional tour for their book Growing Up Duggar. While the interview was intended to make the girls seem normal and relatable (even though they are four of 19 and participate in a religious sect which blames young girls for molestation), it’s now eerily sinister. The interview was brought to our attention by longtime reader and Duggar expert Snacktastic who called that the interview was creepy over a year ago when Jana, Jessa, Jill, and Jinger spoke to Cosmopolitan about getting drunk and being virgins. But now that Josh Duggar’s molestation has come to light, there’s something even more creepy about the Duggars’ answers to questions about love and romance. Okay, not that weird. Lots of people kiss their brothers. But this question is just a lead-up to this series of Qs. Jessa: I can’t say I haven’t been, but it’s the anticipation, the suspense! It’s like Christmas morning, you know? Open this special package so it’ll be fun! Jessa: I’m sure I’ll be getting advice from people who are good kissers! Jessa: My parents are pretty good kissers! They very much like to show their kiss in public places, so they kiss in front of us all the time. [And I’d ask] my oldest brother. He’s been married for five years. And friends and people around me who I look up to. But I don’t think it’s too hard to figure out though. Considering that it’s clear that people in the Duggars’ community knew about Josh Duggar’s molestation charges, it’s incredibly painful to read about Jessa discussing the fact that her oldest brother is a good kisser, especially if she’s pretending that her brother hasn’t hurt her sisters or has been brain-washed into believing that it wasn’t his fault. And while Jessa’s been ignoring the controversy on social media, her father-in-law has spoken out in support of Josh Duggar, stating that anyone who had the chance to would have also molested themselves some girls. Jessa Duggar’s father-in-law goes on to say that fans shouldn’t be shocked by Josh’s actions — he claims that many people would do the same thing if they didn’t fear the consequences of their behavior. No, no it isn’t. For most people, I bet the decision not to molest a child probably doesn’t come down to thinking “I’ll get caught” or “man, I wish I could molest, but there are no kids around. Drat!” And if Jessa’s father-in-law is saying these things out loud now, are any of the Duggar kids (present and future) safe? I don’t know about you, but I’d be mighty concerned by anyone who says that we’d all be out there molesting if we just had the chance.